This porcelain toothbrush holder is identified with Lefton China Hand Painted backstamp, red foil Lefton Japan sticker and stamped as 1550. 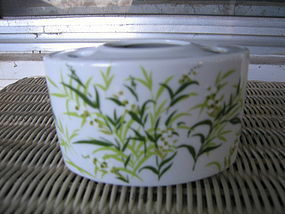 I am calling the design as green leaves, but could possibly be described as fronds. It holds 4 toothbrushes. Very little sign of use. I need your zip code to calculate the postage. Manufactured in 1976. There are no chips, cracks, breaks or rough rims. Minor wear to the trim. 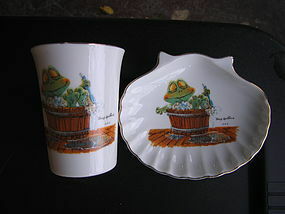 The cup has a small amount of stray paint above the frog's head, or at least that is what it is appears to be. I will be glad to send additional photos. I need your zip code to calculate the postage. 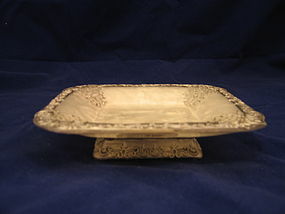 Bar soap dish marked D.A.I.C. 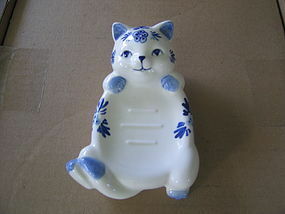 Handpainted Delft Blue. This company is no longer in business. 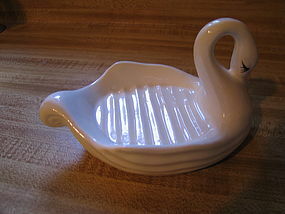 It is a nicer quality porcelain than some of the items of today. 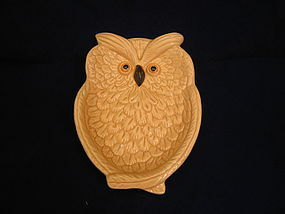 It measures approximately 6 x 4 1/2 x 2 1/2 inches. There is no damage. I need your zip code to calculate the postage. 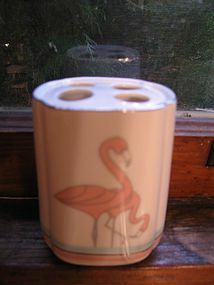 Ceramic toothbrush holder being sold as a replacement to a 3 piece set from the 1980-90 era. 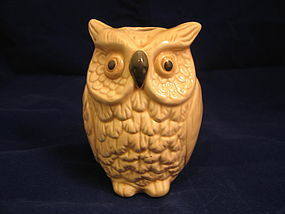 It has 3 holes and measures 4 1/4 inches in height. It has never been used and comes from original boxed set (photo of set is available by email). There is no damage, but has stray paint from manufacturer. I need your zip code to calculate the postage. NOTE: THE COLOR IS SHOWING UP A BIT MORE YELLOW THAN TRUE SHADE. Replacement soap dish to a vintage 3 piece bath set. It is in an unused condition and comes straight from original box. It measures 5 3/8 x 4 x 1 1/4 inches. There is no damage, but has normal manufacturing flaws. Additional identification photos (shown with all pieces and original box) by email. I need your zip code to calculate the postage. 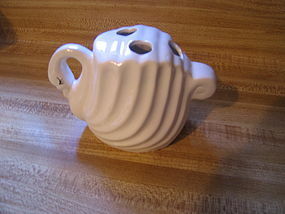 Being sold as a replacement to a vintage 3 piece bath set of tumbler, soap dish and toothbrush holder. The color is not coming out properly in pic - it is more of a tan shade than the yellow in photo. The listed item is the 3 1/2 inch tumbler. It comes from an unused boxed set. There is no damage, however, does have manufacturing flaws. Other pieces of the set are available. A photo of the original set is available for identification purposes. I need your zip code to calculate the postage. The toothbrush holder is being sold as a replacement to a 3 piece set. 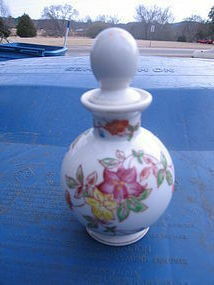 It is manufactured by Springs Global and called Shangri la (the label spells it Shangrila). The set was not used. 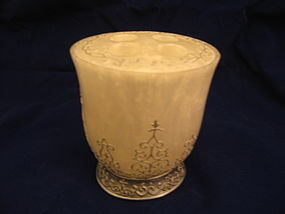 It is a marbleized white with pewter toned accents. There are 4 toothbrush holes and measures 4 1/2 inches in height. There is no damage. Other pieces are available. I need your zip code to calculate the postage. Label identifies as Spring Global Shangrila (spelled as one word on label). 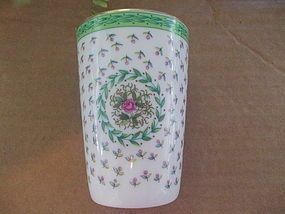 The tumbler is part of an unused bathroom set from a few years ago, and being sold as a replacement. It is marbleized acrylic/plastic with pewter toned trim. The height is 4 1/2 inches in height. There is no damage. Other pieces of the original set are available. I need your zip code to calculate the postage. 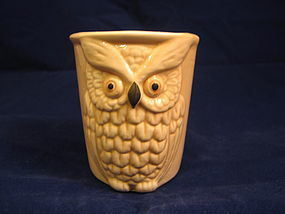 Vintage toothbrush holder in a very nice quality porcelain. It is marked as Saturday Knight Japan. Very little sign of use, although there is a tiny loss of the gold trim in one place, which may not be wear, but a factory miss. I need your zip code to calculate the postage. 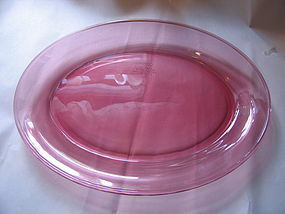 Increasingly difficult to find Corning Cranberry platter. It measures 14 x 8 3/8 inches. Very little sign of use. I need your zip code to calculate the postage. 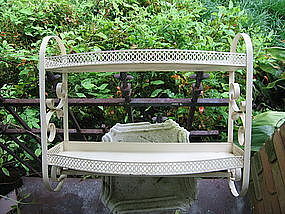 Vintage ivory metal shelf with towel rack. It measures 15 3/4 x 14 1/2 x 6 3/4 inches. There is no dents or warping, but it has been repainted a couple of times, and is showing loss to the finish. 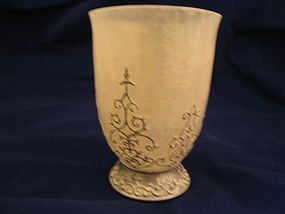 It is also available in a gold finish. I need your zip code to calculate the postage. 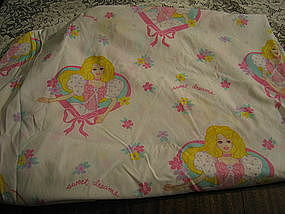 Twin fitted sheet manufactured in 1997 by Bibb. The sheet has no rips, tears or stains and the colors are still bright. 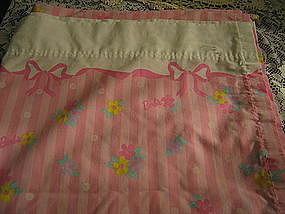 The matching flat sheet is available. I need your zip code to calculate the postage. Twin Flat sheet manufactured 1997 by Bibb. There are no rips, tears or repairs. It had no stains, until I laundered and ironed for the photograph. If you will look closely at the photograph, you will see a small area, where my iron let a trace of residue. It is not scorched, but is starch residue. It will probably come off, but fortunately it is the corner, which does not show. The matching fitted sheet is available. I need your zip code to calculate the postage.